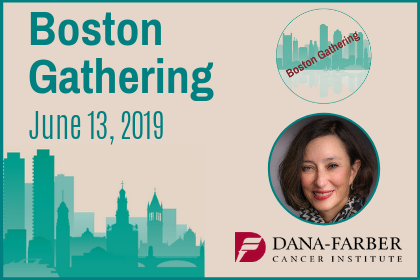 Please join us on Thursday, June 13 at The Winter Garden Atrium for the third annual Boston Gathering! 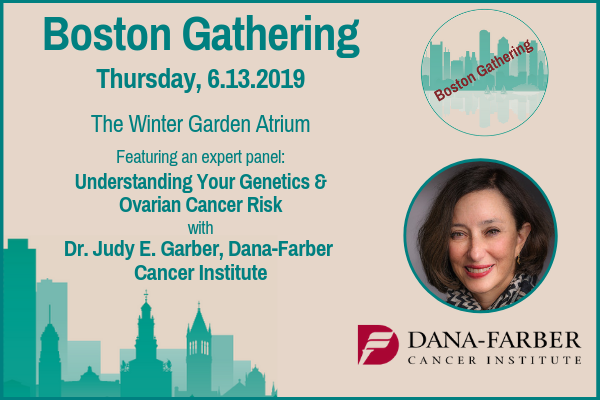 The evening will feature an expert panel discussion, Understanding Your Genetics & Ovarian Cancer Risk, with Dr. Judy E. Garber, Dana-Farber Cancer Institute. Event proceeds will go towards our Rising Star Grant, to benefit a non-tenured, innovative researcher dedicated to early detection ovarian cancer research. CLICK HERE to learn about our funded research. CLICK HERE to learn more about the evening’s featured speaker, Dr. Judy E. Garber. CLICK HERE for a recap of the 2018 Boston Gathering. CLICK HERE TO JUMP TO THE REGISTRATION FORM. Greg Milmoe, Esq., Greenberg Traurig & Laura Milmoe, Esq.